Am I Artistic or What? | What Is? Am I Artistic or What? With my nineteen years of existence, never did I write a poem, novel, story or whatever it is that is too creative that I may give to someone. Never. Until now. When I first heard the “Hey Daydreamer” (HD) song, I thought, Wow. Cool. Another from a foreign artist. Well guess what? I faced the word IN YOUR FACE in all-caps, bolded, italicized and underlined for this song was from a young Filipino artist. Weeks later, I bumped into Andi9 and Jessica’s (of the Magic Top5@5) Ustream and found myself really mesmerized by the guy behind the works of Someday Dream–the genius responsible for the HD song. *Watch his live performance at the Magic booth here!! * From then on, I kept an eye on the band’s has-whats for I surely know that there would be so much more in them now and in the future. 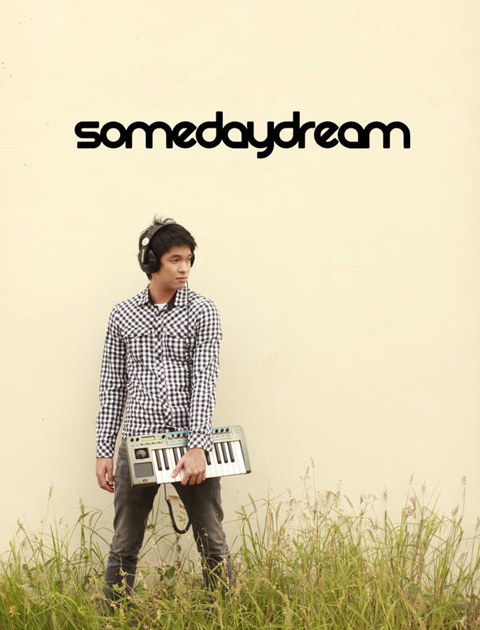 Rez Toledo is the guy behind the works of the song Hey Daydreamer and the one-man band, Someday Dream. He is twenty years old; a Sophomore student at the Ateneo De Manila University, taking up Management. Hey Daydreamer is a song inspired by a girl he (Rez) really admired a couple of years back. If you know how to do the math, that’s how old the song is. Its Unplugged Version was released last 14th of February at the Magic Top5@5 when CJ from the Big Meal got some problems playing out at their program. Currently, the song placed the eighth spot at the Magic 30 Countdown and fourth on RX top 7 Countdown. They (the Dream Team) got the name Someday Dream courtesy of Rez’s creative juices and random thoughts. They’ve done a lot of radio guestings lately–Magic’s Top5@5, Jam 88.3, Magic’s Big Meal, Playtime on RX 93.1, the Drive on 99.5 RT, Wave 89.1 and surprise visits on Magic’s On Demand and Mellow 94.7. Champ Lui Pio (of Hale) is helping out the band on making its name in the music industry. Stalker or Fan? I followed him on Facebook and Twitter as well. 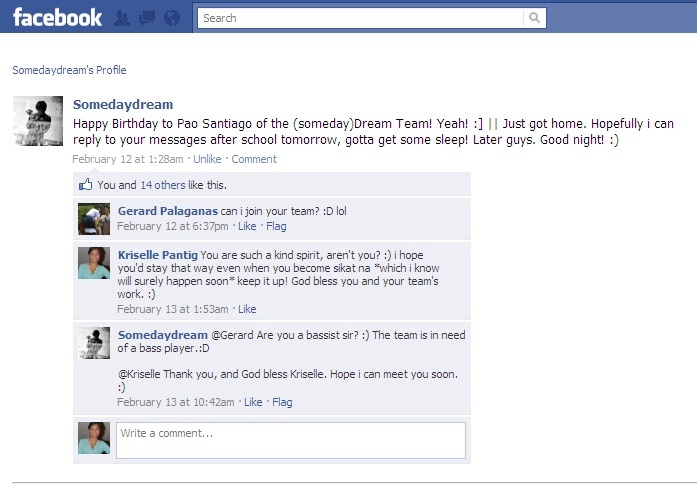 I was really happy because the guy appreciates and keeps the fans posted. He makes it appoint to reply from all those fan concerns and comments; he sincerely shows gratitude for all the support he’s getting. Actually, what made me really glad was this (him taking time to reply to those fan comments I’m talking about). And so, even if I don’t wanna be one, but from the looks of it I am (one heck of a Fan!!). Here’s a song lyric (have no idea of how it would sound, yet) for the guy who inspired me to write stanzas of non-sense thoughts and verses of crazy antics. He won’t be able to read this anyways, and so, I’ll be living relieved. ‘Hope I can meet you soon’, is that what it reads? I genuinely hope that he’ll stay humble, cool and simple. Well yeah, Someday Dream rocks!! Woot woot! I’m not really a fan. This is so hard to admit. Dang! I’m a fan. This entry was posted in Arts, Dreams, Inspirations, Journal, Music and tagged For Mister Rez Toledo, Hey Daydreamer, Some Poetry, Someday Dream. Bookmark the permalink. you forgot to include that in your Ustream episode, you tortured other 4 innocent girls into your fangirling.